WINGATE, N.C. — A man here who spent his time trying to improve his neighborhood was shot to death on Monday while streaming on Facebook Live, authorities said. Prentis Robinson, 55, was gunned down roughly one block from police headquarters where he had just stopped to report a stolen cell phone, according to Wingate Police Chief Donnie Gay. The suspect, 65-year-old Douglas Cleveland Colson, surrendered Tuesday to the Union County Sheriff's Office, according to Gay. Colson, a lifelong Wingate resident, has been arrested before. In the footage, which Facebook has since removed but was viewed by NBC News, Robinson can be seen walking down a street in Wingate, south of Charlotte, with a cell phone attached to a selfie stick. “You on Live,” Robinson says repeatedly to someone off-camera who appears to be moving toward him. The person, whose face isn’t visible, then appears to fire four gunshots. Robinson tumbles to the ground. In a statement, Facebook said it removed the post because the company couldn't have known if Robinson wanted "this horrific act to be live streamed on social media." Gay said the suspect was wearing blue jeans, brown Timberland-style boots and a black and blue windbreaker. 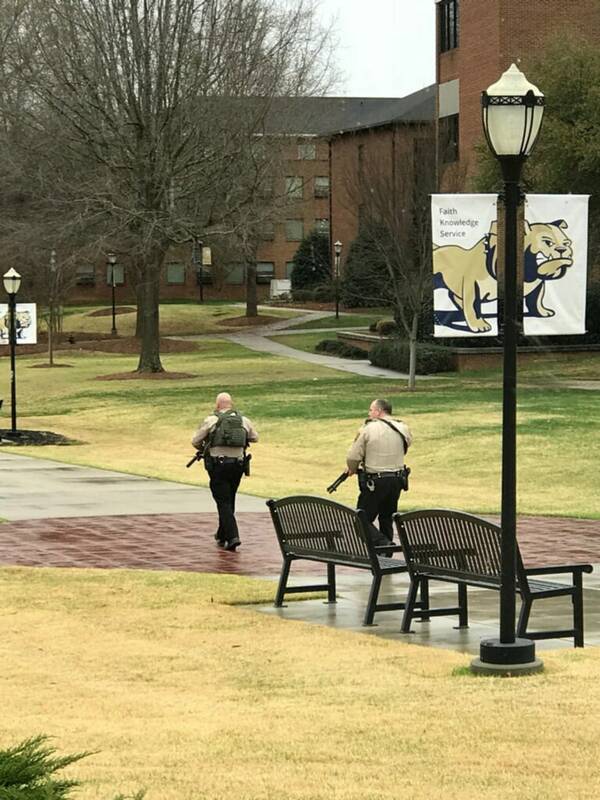 Citing local police, Wingate University — which briefly put its campus on lock down after the nearby shooting — added in a statement that the suspect was armed with a long gun. It wasn’t clear why Robinson was targeted, Gay said, though his killer didn’t seem to care about appearing on camera — or shooting someone so close to the police department. "Only being a block or so away from the police department — if that’s not brazen I don’t know what is,” Gay said, adding: "It's heart breaking. I can’t believe it." A friend of Robinson’s, Chester Sanders, said the videos — which included Robinson highlighting illicit neighborhood activities, like drug dealing — likely made people upset. In a video posted on his way to the police station on Monday morning, Robinson can be seen walking through the neighborhood with his selfie stick. He waves to passing cars, contemplates singing birds, complains about his stolen cell phone and worries about the area’s elderly residents. "They're afraid of some of the activities going on,” he said, adding: "I’m trying to keep the neighborhood quiet like this — peaceful." Alyssa Newcomb and Daniel Arkin contributed.